2.2 It is your responsibility to ensure that enough time is allowed for the journey required and A1 Cabco Taxis cannot be held responsible for any unforeseen delays to the journey such as traffic, weather or circumstances beyond our control or if passengers are not ready at the time of collection. 2.3 It is your responsibility to ensure that the expected time of arrival is correct and that the correct terminal has been given, A1 Cabco Taxis cannot be held responsible for the ETA arrival information provided by the airlines being accurate when checking ETA arrival information. A1 Cabco Taxis will check with the airlines for flight delays or alterations before the driver leaves for the airport but if unable to for whatsoever reason we cannot be held responsible if the flight is delayed or arrives early. You will still be responsible for payment of the journey unless you have contacted our office in advance. 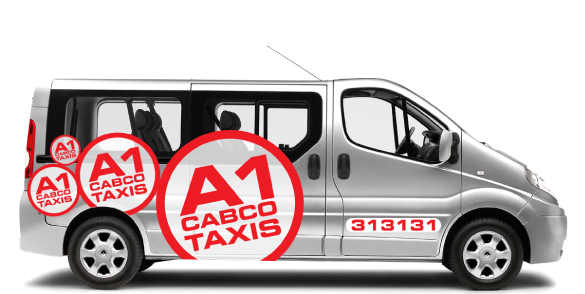 2.4 A1 Cabco Taxis will provide you with a quotation based on the information provided at the time of booking. A1 Cabco Taxis will amend the quotation if there is any material change to the original booking without prior knowledge. 2.5 A1 Cabco Taxis will not be held responsible for any delays or costs arising from your failure to provide us with correct booking information. 3.5 Credit/Debit card details will be required on all long distance journey's as security for the driver. 3.7 A1 Cabco Taxis reserves the right to request Identification from a passenger when booking with credit/debit cards. 3.8 Management reserve the right to charge an administration fee if a booking is cancelled through no fault of our own and at the request of the customer. The amount charged is at the discretion of The Management team. 4.1 If you need to cancel your booking, please contact A1 Cabco Taxis as soon as possible. If the vehicle has already been dispatched then a charge will be incurred equal to the distance travelled by the driver to the collection point. If a charge is then made to a credit or debit card held as security only, this charge will incur a 5% surcharge. 4.2 A refunds policy will only be offered on a discretionary basis following a letter of dissatisfaction with the service provided. In the event that Management agree a payment is to refunded, A1 Cabco Taxis will make the refund back to the credit/debit card from which the original payment was made within 48 hours. A cheque will be made to the named cardholder only if this service is unavailable. 5.1 Smoking, drinking and eating is not permitted in the vehicles. You will be charged £80.00 to cover valeting costs in the unlikely event of the vehicle being soiled by a passenger. 5.2 A1 Cabco Taxis are permitted by law to carry only passengers as allowed by the licence and insurance. Your journey will be refused if passengers are in excess of the allowance. 5.3 A1 Cabco Taxis are only permitted to take passengers through booked only jobs. 5.4 You will be held responsible for the behaviour of each passenger in the vehicle during the journey. You will indemnify A1 Cabco Taxis against all losses, expenses, costs or damages caused by the actions of a passenger you are responsible for. 6.1 A1 Cabco Taxis has the unconditional right to terminate or refuse any booking with immediate effect when it places the driver at risk of abuse, violence or damage by either you or any passenger for whom you are responsible. No refunds will be given under any circumstances if the journey is terminated in this respect part way through the hire. 7.2 A1 Cabco Taxis will not be responsible for installing baby or child seats into a vehicle. This is the responsibility of the parent or person responsible for the child at the time of the journey. 7.3 A1 Cabco Taxis has the right to cancel all services and provide refunds in the event of extenuating circumstances beyond our control such as terrorist attack, riot, national emergency, national disaster or war. 7.4 A1 Cabco will endeavour to arrange an alternative vehicle as soon as is practical in the event that your vehicle breaks down and get you to your destination. A1 Cabco Taxis will not be held responsible for any losses, costs, expenses or damages resulting from the breakdown of a vehicle. 7.5 A1 Cabco Taxis will endeavour get you to your destination on time, we cannot be held responsible for any losses whatsoever for conditions such as heavy traffic that are beyond our control during the journey. There is no circumstance under which any factors out of our control will cause A1 Cabco Taxis to be liable for any personal loss or business loss whatsoever such as loss of profits. 8.1 Under this agreement, A1 Cabco Taxis can subcontract its obligations. You shall not assign, transfer or delegate any of your rights or obligations under this agreement. 8.2 A1 Cabco Taxis shall store, process and use all information regarding your personal details in accordance with the Data Protection Act 1998. 8.3 A1 Cabco Taxis reserves the right to amend these terms and conditions at any time. You are responsible for reviewing these conditions periodically to ensure that you are aware of any changes posted online. 8.4 This agreement and any accompanying price quotation represent the entire agreement between you and A1 Cabco Taxis in relation to its subject matter. If there is any discrepancy between the terms of this agreement and the quotation, then the terms of this Agreement shall prevail. This agreement shall be construed in accordance with English Law and you and A1 Cabco Taxis each agree to submit to the exclusive jurisdiction of the English Courts in respect of any dispute or claim arising out of or in connection with this agreement.